The contract chipmaker has long depended on smartphones for growth, but that won't be enough going forward. 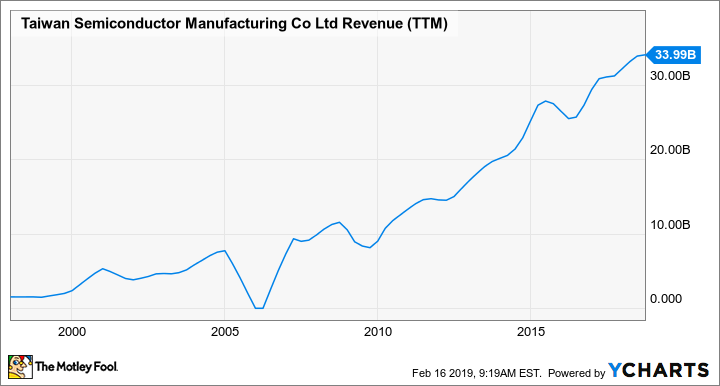 Taiwan Semiconductor Manufacturing Company (NYSE:TSM) has benefited greatly from the smartphone boom. Smartphones have evolved dramatically since the launch of the original iPhone back in 2007, and underpinning that evolution have been increases in semiconductor content inside these devices. Since TSMC manufactures chips for many Apple suppliers, as well as directly for Apple, that semiconductor content growth, coupled with the dramatic growth in smartphone unit shipments over the years, has benefited the company. TSM Revenue (TTM) data by YCharts. However, the smartphone boom is over. The smartphone market saw a second consecutive year of smartphone unit shipment declines in 2018 and is on pace for a third, according to market researchers with IDC (via EETimes). And, although TSMC has indicated that the imminent transition to 5G wireless -- something that should help boost silicon content per smartphone because of the increased complexity of 5G technology compared to 4G LTE -- should help drive long-term growth, it seems like a good bet that the smartphone market won't be enough to sustain TSMC's long-term growth ambition of compound annual revenue growth between 5% and 10%. So TSMC needs to look beyond smartphones for additional growth. The logical question that comes to mind is whether the company can find it. The answer seems to be yes. Here's why. Although smartphones will continue to be a huge part of TSMC's business, the company has been talking up the growth opportunities in the high-performance computing (HPC) portion of the market. The area includes products such as graphics processing units (GPUs), central processing units (CPUs) for things like PCs and data center applications, field-programmable gate arrays (FPGAs), and network switch silicon. "With the successful ramp of 7-nanometer, we are able to expand our customer product portfolio and can add applications related to PC and tablets to the HPC platform," said TSMC CEO C.C. Wei on the company's fourth-quarter 2018 earnings call. "With this inclusion, we believe HPC will become the largest contributor to our business in terms of revenue growth in the next five years." Now, keep in mind that Wei didn't say that it'd be the largest piece of the company's business, but that it'd be the largest contributor to revenue growth. For some perspective, TSMC CFO Lora Ho explained during the call that in 2018, 45% of the company's revenue came from smartphones, 30% to 32% came from HPC, and the rest came from various areas such as Internet of Things, automotive, and digital electronics. "A lot" of that HPC revenue, Wei conceded, came from sales of chips used to mine cryptocurrencies (cryptocurrency mining has become a lot less attractive these days as the prices of various cryptocurrencies have plummeted) and those revenues are bound to decline. Over the long term, though, once the revenue from cryptocurrency mining has worked its way out of TSMC's system, the opportunities in HPC, collectively, look attractive. Indeed, although the company's 7-nanometer technology seems to have attracted a lot of HPC customers, Wei indicated that interest from HPC customers for its follow-on technology, known as 5-nanometer, is even more significant. "We expect more applications in HPC to adopt N5," Wei said. "Thus we are confident that N5 will also be a large and long-lasting node for TSMC." TSMC's job isn't to design products -- it's to build technology-manufacturing platforms that attract the companies that do design products to use its manufacturing technology. It's clear that although many of the world's top smartphone-chip manufacturers utilize Taiwan Semiconductor's technologies for their products, the company seems to be doing a phenomenal job of laying out the groundwork for makers of HPC chips to succeed. If those customers are successful, TSMC should be, too.